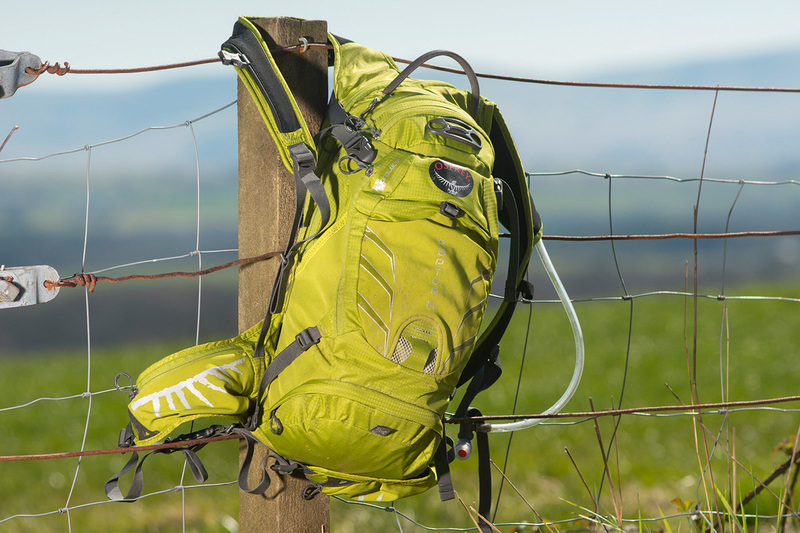 The Osprey’s semi-rigid reservoir made for easy handling, and the zip around the reservoir compartment and down the shoulder guide makes it the simplest to remove and refill. A strong magnet on the sternum strap kept the drinking tube from flailing around, while a highly innovative tool wrap zips out the bottom of the pack and unrolls to make trailside repairs a little more painless. There’s even an area on which you can lay disassembled parts without fear of losing them. On the bike, the waist belt and sternum straps combine with effective compression straps to hold everything in place nicely, whether stuffed to the gills or half-empty. Pockets on the waist belt are just the right size for bars, gels, or even a mid-sized multi-tool, while wet jackets can be kept out of harm’s way in the elastic rear pocket.